Tikkun Olam, a medical marijuana farm in Israel, blends the high-tech and the spiritual. SAFED, Israel — Among the rows of plants growing at a government-approved medical marijuana farm in the Galilee hills in northern Israel, one strain is said to have the strongest psychoactive effect of any cannabis in the world. Another, rich in anti-inflammatory properties, will not get you high at all. Marijuana is illegal in Israel, but farms like this one, at a secret location near the city of Safed, are at the cutting edge of the debate on the legality, benefits and risks of medicinal cannabis. Its staff members wear white lab coats, its growing facilities are fitted with state-of-the-art equipment for controlling light and humidity, and its grounds are protected by security cameras and guards. But in addition to the high-tech atmosphere, there is a spiritual one. 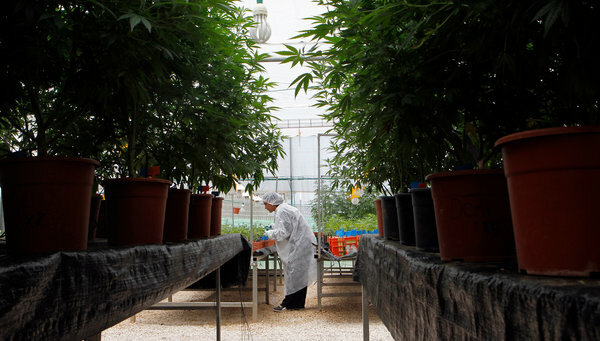 The plantation, Israel’s largest and most established medical marijuana farm — and now a thriving commercial enterprise — is imbued with a higher sense of purpose, reflected by the aura of Safed, an age-old center of Jewish mysticism, as well as by its name, Tikkun Olam, a reference to the Jewish concept of repairing or healing the world. There is an on-site synagogue in a trailer, a sweet aroma of freshly harvested cannabis that infuses the atmosphere and, halfway up a wooded hillside overlooking the farm, a blue-domed tomb of a rabbinic sage and his wife. In the United States, medical marijuana programs exist in 18 states but remain illegal under federal law. In Israel, the law defines marijuana as an illegal and dangerous drug, and there is still no legislation regulating its use for medicinal purposes. Yet Israel’s Ministry of Health issues special licenses that allow thousands of patients to receive medical marijuana, and some government officials are now promoting the country’s advances in the field as an example of its pioneering and innovation. Israelis have been at the vanguard of research into the medicinal properties of cannabis for decades. In the 1960s, Prof. Raphael Mechoulam and his colleague Yechiel Gaoni at the Weizmann Institute of Science isolated, analyzed and synthesized the main psychoactive ingredient in the cannabis plant, tetrahydrocannabinol, or THC. Later, Professor Mechoulam deciphered the cannabinoids native to the brain. Ruth Gallily, a professor emerita of immunology at the Hebrew University of Jerusalem, has studied another main constituent of cannabis — cannabidiol, or CBD — considered a powerful anti-inflammatory and anti-anxiety agent. When Zach Klein, a former filmmaker, made a documentary on medical marijuana that was broadcast on Israeli television in 2009, about 400 Israelis were licensed to receive the substance. Today, the number has risen to about 11,000. Israeli researchers say cannabis can be beneficial for a variety of illnesses and conditions, from helping cancer patients relieve pain and ease loss of appetite to improving the quality of life for people with post-traumatic stress disorder and neuropsychological conditions. The natural ingredients in the plant, they say, can help with digestive function, infections and recovery after a heart attack. The marijuana harvest, from plants that can grow over six feet tall, is processed into bags of flowers and ready-rolled cigarettes. There are also cannabis-laced cakes, cookies, candy, gum, honey, ointments and oil drops. The strain known as Eran Almog, which has the highest concentration of THC, is recommended for severe pain. Avidekel, a strain rich in CBD and with hardly any psychoactive ingredient, allows patients to benefit from the drug while being able to drive and to function at work. Working with Hebrew University researchers, the farm has also developed a version in capsule form, which would make exporting the drug more practical, should the law allow it.